Salads as we all know, are very healthy but making it interesting is a tough task. Many ladies who want to lose weight, will stick to salads, at least one meal a day but after few days the interest in eating salads will come down . Also one more major block here is we cook usual meal for the family and after all that we will eat salads . So over a period of time we will start craving for the daily meal. Now you can add sambar, rasam, vathakuzhambu, paruppu podi, karuvepillai podi, paruppu usili and if you are a north Indian, you can add dal, kadi or some spicy subzi which you make daily. Avoid adding deep fried items to the salad. You can add roasted papad too. 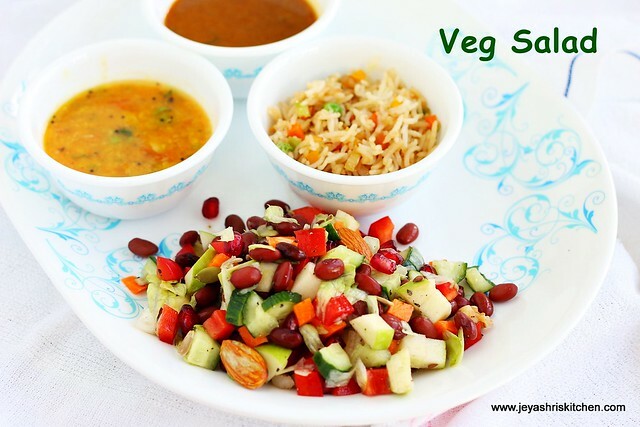 After experimenting many combos at home, I finally came up with a super easy vegetarian salad recipes. For the past 2 months I am having salads for one meal a day, mostly for dinner. I feel so complete and full and never crave for regular food. You can add 2 spoons of rice or pasta or noodles into the salad.Be creative and make your salads interesting. Check out my diet plan with Indian recipes. I have given the basic recipe for the salad below. Check out my frozen beans post and keep the legumes handy. Check out this bluetiful world and commit for weight loss. Each kilo you drop a tree will be planted and nurtured , the proceeds will go for the education of meritorious student. Post a picture of your salad and share it with me on Facebook or Instagram. Follow jeyashris kitchen on facebook , instagram or email me at jeyashrikitchen@gmail.com. Scroll down for more tips. Chop the carrots, apple ,capsicum and cucumber. You can either cut them into small or chop them into medium cubes. Put all the veggies and fruits into a bowl. Add salt and pepper powder to this and mix well. Now you can make the dressing as per your wish. Either refrigerate the salad or eat it immediately. You can add papaya, pineapple, watermelon, pear, plum, orange, dates, guava to the salad. Boiled potatoes can also be added. It will not add up fat. Do not fry, just boil potato by adding little salt and cut them into cubes and add. Chickpeas, roasted peanuts, lobia(black eyed bean), sweet corn, black bean, horse gram, sprouts, cabbage ,raw mango, grated beetroot can also be added. If you want them crunchy add microwaved papad and add it just before eating. Boiled noodle or pasta can be added to this, to make it filling. I make like this when i am having the salad for lunch. Brown rice or any cooked millet can also be added. Add pasta, noodles,rice in moderate quantity. 2 -3 tblsp will be enough. 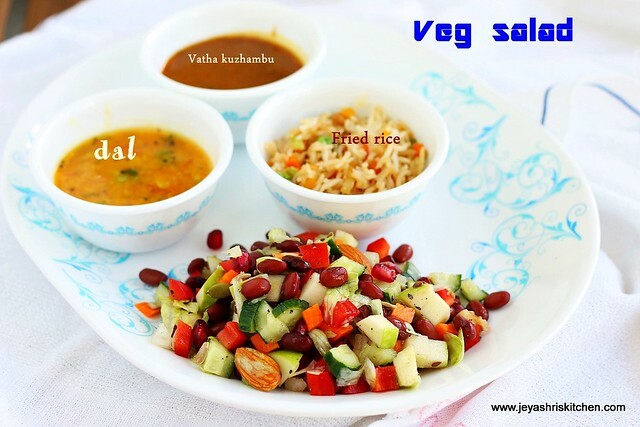 As mentioned above, you can add sambar, vatha kuzhambu, paruppu usili, rasam, thogayal,or any podis to the salads. Dal and kadi can also be added. Even little biryani can also be added to your salad. Your craving for biryani will also be satiated and at the same time you will eat healthy too. Thanks Jeyshrithe most excellent recipe you have posted must say. 😄Thanks for sharing and directing us to a good cause. Very very truthful words. I start eating salads so many times, but am not able to be persistent. I cook whole South Indian meals for my family, and after smelling and tasting them, it is hard to eat only salads for my lunch/dinner. Very practical one. Thanks jeyashri. Akka,how can the dressing of honey and lemon here be enhanced with some south Indian spices? What do u recommend?